As the rollercoaster Oregon football season continues, the recruiting season is keeping Duck fans guessing also. It’s been up, it’s been down, but this is a well-rounded recruiting class as it stands right now. Currently, the 2016 class is standing strong at 13 verbal commitments; and yes, there are a few quarterbacks in this class. In fact, the Ducks have two commitments right now at the position, but that number could go up, or down, in the near future. Four-star, Seth Green, has been an Oregon pledge for a while now, but according to Andrew Nemec of Oregon Live, there has been rumors that he could de-commit from the Ducks. Hopefully Seth Green remains a Duck. 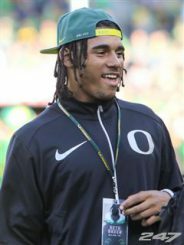 Losing a prospect, and a talent, such as Green would certainly be a loss for the Ducks as they continue to search for Marcus Mariota‘s replacement. The Texas native comes in at 6-foot-4, 215 lbs., and has the athleticism reminiscent of a certain former three-star quarterback from Hawaii. However, with him struggling during his senior year, and the fact that the Ducks flipped quarterback Terry Wilson from Nebraska, the waters have become a bit murkier involving his recruitment. According to Nemec, “Green said over the weekend that his relationship with the Ducks was “still good” and that he “(hasn’t) de-committed.” This situation will certainly be something for fans to keep their eyes on. Even if Green decides to play elsewhere, things are still looking up in regard to the quarterback position. With Travis Jonsen (four-star recruit last season) redshirting right now and hopefully memorizing the offense, Oregon does have some potential at quarterback currently on the roster. But, as this season has shown, it’s always good to have options. The aforementioned Wilson is certainly a playmaker at QB, and will bring explosiveness back to the position for the Ducks if he is to sign. Also, FishDuck.com‘s Mark Flores recently wrote that Oregon might send an offer to unranked quarterback Justin Herbert, out of Eugene. Adding a player of that size is certainly a plus, but Herbert is probably unranked nationally for a reason. If Green does de-commit, I believe Herbert will likely receive the offer in his place. We will continue to monitor the quarterback position for the future, as the Ducks are shaping up to possibly sign 2-3 QBs for this class. 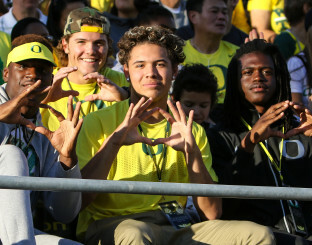 LaMar Winston (left), Brady Breeze (back left), Cam McCormick (middle) and Terry Wilson (right) at the Eastern Washington game. Not only is this weekend’s game against Washington State huge for the 2015 football season, it’s also huge for the recruiting trail as well. The Ducks will be hosting a total of nine players for official visits this Saturday, and there is some star power on that list. Five players visiting are already committed, LaMar Winston, Brady Breeze, Jared Mayden, Dillon Mitchell, and Cameron McCormick, but it’s the other four who the Ducks really need to impress. Oregon is in great position to sign three-star lineman, Michael Alves, who will be in attendance on Saturday. The Ducks certainly could use depth at offensive and defensive lineman, so Alves adds to a class that has both a guard and a tackle already verbally committed. Headlining the list is five-star linebacker, Caleb Kelly, who is currently a soft verbal commit to Oklahoma. His pledge to the Sooners is certainly serious, but also not official. This visit to Eugene could become a big factor in his recruitment as the season progresses. The Ducks have swayed big time recruits in the past, and linebacker is major position of need. 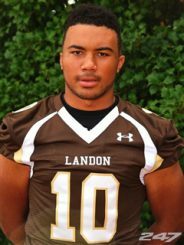 Another linebacker who will be in attendance is Keith Simms, an outside linebacker from Maryland. Simms is another player who is currently verbally committed elsewhere, but as mentioned above, you never know what can happen. Also, it has been noted, that Maryland may be in danger of a coaching change in the very near future, so that could definitely become a factor down the road. It’s been mentioned before, linebacker is the biggest need, aside from finding an answer at quarterback, for this year’s class. With two commits already, the Ducks are in good position to sign four or more when everything is finalized. It’s almost the middle of the regular season, so expect things to start heating up on the recruiting trail. The Ducks have several needs to fill, and plenty of scholarships to still give out before everything is set in stone. Stay tuned to FishDuck.com for updates as signing day approaches. Special thanks to Duck Territory at 247sports.com.